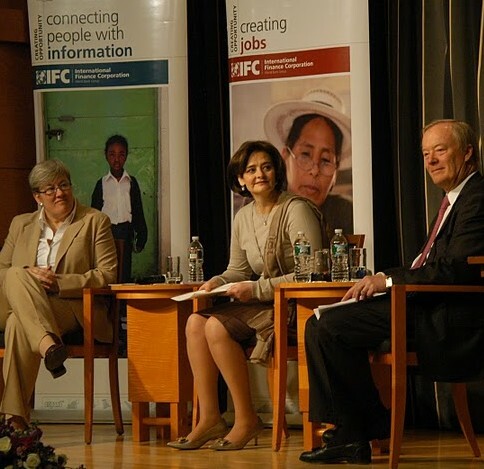 The IFC is aiming to collect more data on women-owned SME’s access to finance in the region. In her June 2011 letter, Executive Director Teri Cavanagh discusses the latest happenings around female economic empowerment. The June 2011 New Member Spotlight welcomes Bank of Deyang, Garanti and BLC Bank to the Alliance. The IFC’s Village Phone program has helped provide credit to nearly 6,000 women and trained close to 10,000 to set up phone service businesses in Madagascar, Malawi, and Nigeria. Larke discusses the 2011 GBA Summit, held in Sydney, Australia, at Westpac’s headquarters, as well as the Study Tour. GBA Executive Director Teri Cavanagh discusses the 100th anniversary of International Women’s Day. This article from The Financial details how GBA member IFC is working with member Banco Comercial e de Investimentos (BCI) to train women in business management. To mark International Women’s Day, Standard Chartered Bank has launched an Arabic version of the Women in Business Resource Centre. Larke shares the news that GBA member Westpac has become a key signatory to the UN Global Compact’s Women’s Empowerment Principles. GBA Chair Larke Riemer discusses International Women’s Day. On March 17, 2010, GBA banks and prospective members met in Kampala, Uganda, to discuss access to finance. This story from The Financial explores the launch of the UN Global Compact’s Women Empowerment Principles.